Bitter pill: Negative results from clinical trials of two antidepressants, Celexa and Prozac, challenge the idea that a serotonin imbalance causes some autism symptoms. The popular antidepressant citalopram — marketed under the brand name Celexa — is no better than placebo at reducing repetitive behaviors in children with autism, according to a study published in the June issue of the Archives of General Psychiatry1. Citalopram is a selective serotonin reuptake inhibitor (SSRI), a class of drugs that keep brain cells bathed in the neurotransmitter serotonin, a signaling molecule that helps regulate mood, appetite and sleep. 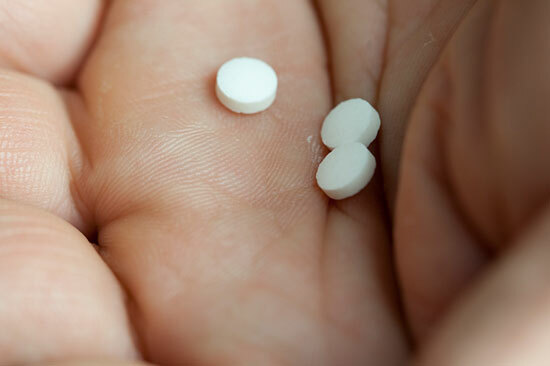 Although citalopram was approved by the U.S. Food and Drug Administration for treating depression in adults, doctors often prescribe it ‘off-label’ to children with autism who have repetitive behaviors — such as hand-flapping — or inflexible daily rituals. Emerging evidence challenges the long-held belief that serotonin deficits underlie such behaviors, say the study’s investigators. Their findings follow disappointing results from another clinical trial, released in February, which showed that the SSRI fluoxetine — marketed as Prozac — is also ineffective at alleviating repetitive behaviors in children with autism. The new trial tested 149 children with autism and repetitive behaviors; half took citalopram, and the other half placebo. Over the course of 12 weeks of treatment, the researchers periodically rated the children using the Clinical Global Impressions (CGI) scale — a qualitative assessment of psychological health and ability to function in daily activities that includes a measure of repetitive behaviors. The number of children who had fewer or less severe repetitive behaviors did not significantly differ between the two groups: 32.9 percent of those treated with the drug and 34.2 percent of those treated with placebo showed a score of ‘much improved’ or ‘very much improved’ on the CGI scale. “We absolutely were surprised and disappointed that we didn’t see a signal,” says lead investigator Bryan King, professor of psychiatry and behavioral sciences at the University of Washington in Seattle. In fact, the researchers recruited the large sample with the expectation that citalopram would work. They had planned to eventually subdivide the children based on specific genetic and behavioral features of autism, to see whether certain groups would stand out from others as benefitting from the drug. “We were powering the study to be able to go two or three steps down the path,” he says. Because citalopram does alleviate repetitive symptoms in some people with obsessive compulsive disorder (OCD), the study results may challenge the idea that the brain circuits responsible for repetitive behaviors in autism are the same as those disrupted in OCD. In 2007, Feng and colleagues created the first mouse model of OCD by deleting a gene involved in the transmission of another neurotransmitter, glutamate. The animals usually display obsessive grooming behaviors, but fluoxetine treatment dramatically suppresses them, the researchers found2. These findings suggest that the mechanisms of repetitive behavior in OCD and autism come from the interaction of serotonin with other chemicals, Feng says. More genetic and electrophysiological evidence is surfacing that implicates glutamate as a key element of the neural circuits underlying OCD3. Serotonin is known to modify the transmission of other signaling molecules, so it’s possible that the glutamate is the main player in repetitive behaviors, with serotonin serving a more supporting role, Feng says. An alternative explanation is that autism stems partly from serotonin abnormalities, but they are more severe or widespread than those in OCD. That would make children with autism less sensitive than people with OCD to the doses used in the study. Despite the unclear picture of how serotonin abnormalities might play a role in autism, clinicians are not ruling out SSRIs as a treatment for some children with the disorder. The new study failed in its primary goal of showing that citalopram quells repetitive behaviors. But compared with controls, the children who received the drug showed slight improvements in irritability symptoms, notes Edwin Cook, a visiting professor of psychiatry at the University of Illinois at Chicago. Cook and his colleagues used irritability as the primary outcome for a 2005 study evaluating escitalopram — a slightly different chemical version of citalopram — in 28 children with pervasive developmental disorders, a group of cognitive disabilities that includes autism. The team found that 10 weeks of escitalopram treatment improves irritability as well as CGI scores in this group of children4. For the current study, King says the group chose the CGI scale as a primary measure rather than a scale for irritability because they wanted to measure the drug’s effect on many additional symptoms, such as social and communication deficits. “In the event that we were wrong about citalopram’s effect on repetitive behaviors, and there was some other facet of these kids’ lives that was clearly getting better, we didn’t want to miss that,” he says. The slight improvement in irritability symptoms with citalopram, though statistically significant, is too small to reflect substantial clinical improvements in irritability, King says. Despite disagreement on how to interpret the study, both Cook and King say they will still prescribe citalopram to some children with autism. That’s partly because there are few alternatives: the only drug currently approved for treating autism is the antipsychotic risperidone, which reduces aggression and irritability but often comes with harsh side effects such as jerky movements, dizziness and hyperactivity. Behavioral therapies are usually safer than medications, Cook says. But if a child with autism needs drugs because of severe emotional distress or irritability, then SSRIs are still a better choice than antipsychotics, he adds.